WHY CREATE LIVING SCHOOL GROUNDS? The two articles below are intended as an introduction to the green schoolyard movement. They are a great place to start if you are new to this field. We encourage readers to share these articles with your school communities and school district, to engage them in the idea of greening school grounds. 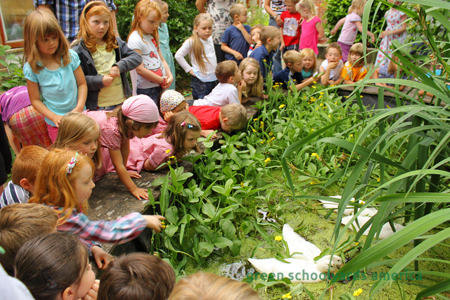 An introduction to the green schoolyard field that is gaining momentum around the world. What can we accomplish if we scale up this movement to reach all of our schools? "Living school grounds are richly layered outdoor environments that strengthen local ecological systems while providing place-based, hands-on learning resources for children and youth of all ages. They are child-centered places that foster empathy, exploration, adventure and a wide range of play and social opportunities, while enhancing health and well-being and engaging the community. Well-designed living school grounds model the ecologically-rich cities we would like to inhabit, at a smaller scale, and teach the next generation how to live more lightly on the Earth—shaping places where urbanization and nature coexist and natural systems are prominent and visible, for all to enjoy. When implemented comprehensively and citywide, living school ground programs have the potential to become effective components of urban ecological infrastructure, helping their cities address many of the key environmental issues of our time."